ABUJA Wife of the Kebbi state Governor, Dr Zainab Shinkafi Bagudu has been elected into the Union for International Cancer Control, the global body for the control of cancer. 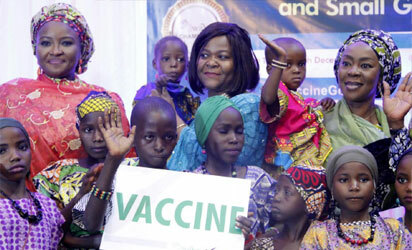 INAUGURATION: From left Wife of Kebbi State Governor,Dr.Zainab Shinkafi-Bagudu; Country Director,Johns Hopkins International Vaccine Access Center (IVAC)/National Convener,Women Advocates for Vaccine Access(WAVA),Dr.Chizoba Wonodi; Wife of Senate President/Founder,Wellbeing Foundation Africa(WBFA),Mrs Toyin Saraki and Children from Settlements in Damangaza Villiage during the inauguration of vaccine champions and small grants programme organised by WAVA in Abuja recently. Bagudu who is the founder, Medicaid Cancer Foundation MCF is the only African to have been elected to the board. At a cancer awareness parley with journalists Friday in Abuja, Chief Operating Officer of the MCF, Dr Suraiya Mansur Mohammed expressed optimism that Dr Bagudu's new position would assist in cancer control in Nigeria. She said the foundation which has trained hundreds of healthcare workers in Kebbi state is moving to spread its tentacles to the six geopolitical zones, explaining that the 1million man Cancer Awareness Walk slated for Saturday in Abuja would help in creating awareness on the disease and generate funds for the expansion of the foundation's activities. Recently, the founder got elected to the board of Union for International Cancer Control UICC. This is the leading body in cancer control throughout the world. She is the first to be elected to that seat in the while of Africa and we are sure that with her current position on the board, she will be able to impact positively on the status of patients and improve on cancer control in Nigeria and the entire continent, she said. On her part, Dr Bagudu said since the inception of Medicaid Cancer Foundation over 10 years ago, the body has screened over 12, 000 patients and also extended treatment support to more than 600 patients in the country. While she lamented the growing cost of cancer screening, diagnosis and treatment, the governor's wife however urged good spirited individuals to contribute in kind to the activities of the foundation. We do not always ask for cash, but for your services in kind, said Mrs Bagudu. She decried the lack of a credible cancer data bank in Nigeria, stating that her foundation was already working with partners to generate a statistical data bank to aid in policy formulation and funding of cancer issues in the country. (c) 2018 Vanguard Media Limited, Nigeria Provided by SyndiGate Media Inc. (Syndigate.info).